Q. During the Australian Open when you were sidelined, if someone said to you that in the warmup clay tournaments you played you would do extremely well and then come here on hard court and beat Roger in straight sets and Berdych and then reach the finals, what would you say to them? RAFAEL NADAL: You never know what’s going in on in the future, no, but sure is something that the things seem always almost impossible until the things are done. But it’s very, very difficult to imagine something like this. But here we are today, and very happy about all what happened the last month, especially last three weeks. Since long time, I think. Is not easy coming back after an important injury after seven months without playing a tournament and be back and winning against three top 10s like David, like David Ferrer, like today against Berdych, the other day against Roger, and to win against Almagro, clay court specialist in Acapulco. So coming back is certainly something amazing for me, totally unexpected, and I received more support than ever from the crowd every place that I played. That’s always a very, very special feeling. Thank you very much, all the people. I am enjoying, sure. Every match means a lot to me. Every time I am able to come back on court and play these kind of matches makes me very happy. Q. When you come back after so long off, what is the most difficult thing to get back at a high level? RAFAEL NADAL: Always, you know, when you are out for a long period of time, is difficult to come back and to understand how to win the points another time, how to manage the important situations. For example, you have a point that you really have to win, you know, like a break point against, like a break point on your favor, and when you are playing tournaments every week and when you are on confidence, you know, even you can change your tactic for a moment. You have your routines and you know what to do in every moment and you have a pre strategy. You have to remember all these kind of things. Sure, physical performance is impossible to be 100%, because even if you practiced a lot at home that was not my case you need to compete to feel 100% ready. You need to compete to feel quick, to feel you know, recover the right vision of the points and the nice reaction in every moment. Everything is new. Even if I had a lot of success the last weeks for example, today I was very nervous at the end of the match to close the match, and was lucky that my serve worked amazing in the last game in important moments. But, you know, there are some things that you need to adjust, and victories like today, like the other day, helps you a lot for the confidence and to remember, you know, all the things that you have to do in every moment. Q. Last week when you arrived here you said you didn’t think you could win the title. What do you think now? RAFAEL NADAL: I cannot still saying these kind of things after a lot of success that I had, but any opponent tomorrow will be a very difficult opponent. They are playing fantastic. Djokovic didn’t lose a match this year, so he’s amazing what he’s doing. And Del Potro is coming fantastically well, winning in Rotterdam, playing very good tournament in Dubai, and now being in semifinals here. So they are playing great, and going to be a very difficult final for me. But is true, I cannot say another thing. I don’t have nothing to lose after seven months. I did much more than what I dreamed. Everything is to win, and any result will be a fantastic week for me, a fantastic tournament. I gonna go on court and enjoy the match and try my best in every moment, as I do usually trying to win, but with good calm that is not the same than when I am playing and when I am fighting for everything. Today I am just here, and for me is a present to be here. Q. If you could just talk briefly about how much you think your confidence has improved since I guess in the final against Zeballos? And then also sort of a separate question about do you think the conditions here the high kicking balls off the court do you think this is as uncomfortable a hard court for you as it is anywhere in the world? 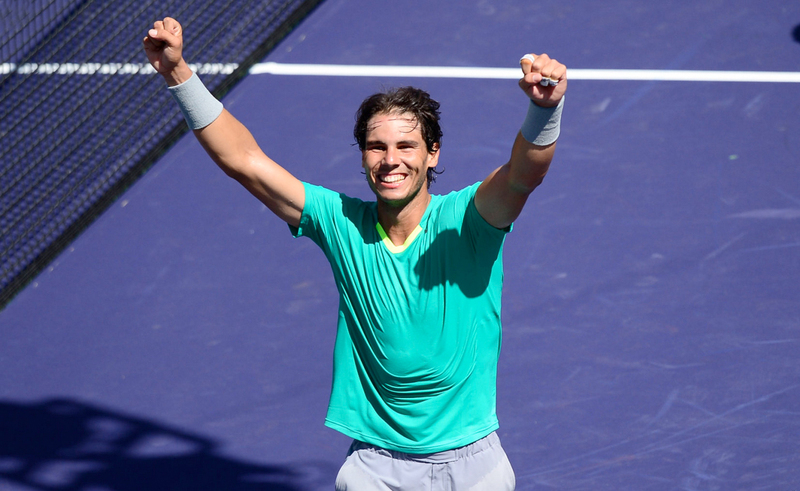 RAFAEL NADAL: The confidence is normal. Even if you didn’t have an injury and you start a season, when you are winning matches, when you are winning against important opponents and you’re winning tournaments, your confidence is improving always. That’s not just for me. That’s for everybody, no? When we have to realize which court is good for me, which court is not good for me, at the end we just have to go and watch the results. That’s just statistics. In a tournament that I played four finals in the last eight years and I played four more semifinals, is a fantastic tournament, no? The conditions adapt very well to my game. That’s the real thing. I feel like home. I feel very comfortable in this tournament. I feel very happy when I am here. Is more relaxing tournament than other ones, and probably that’s give me a positive feeling. Q. Two things: Can you talk more about the serve? You won a lot of big points with it today. And number two, you’ve played Novak 33 times. If you do play him in the final, is it everything new or can you reflect back on all the other matches? 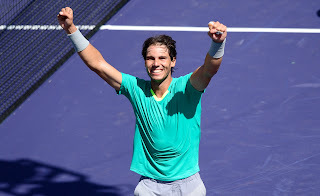 RAFAEL NADAL: The serve was to compete against the best players, even when I was at my 100% physically running to every ball, playing in these kind of surfaces, if my serve was not working minimum well, is very difficult to beat against these kind of players. Today more than ever is very important. My serve worked well. I don’t know the percentage of the first serves, but I think it was quite positive. And the most important thing in important moments if we forget about that double fault in the break point, the 4 3 for the rest of the important moments my serve worked great. That’s very, very important. And against Djokovic nothing is new, no? We played a lot of times and we know each other very well. But is another history for me, not for him. He didn’t stop. But for me is, yeah, new, and for me gonna be a final match. At the end, I don’t want to say test because test was today, test was two days ago, and I felt in good conditions. But, you know, always special to play against Djokovic. I don’t know if he’s gonna win today, but any opponent will be very hard. Q. Yesterday in a TV interview, Lionel Messi said that he admires Kobe Bryant and four tennis players: Djokovic, Federer, Del Potro, and you. Have you met Messi, and who do you admire outside tennis? RAFAEL NADAL: Well, I have met Messi in Barcelona but long time ago. I admire a lot of people outside tennis, no, especially I admire the people who really are, you know, helping the others in the right way, taking his time to take the people who really needs and the good people. If we are talking about sports, Messi, Cristiano are amazing what they are doing. This rivalry is, you know, brings the football to another level in my opinion. Every season they are improving his numbers. That’s something amazing. I love for sure a lot of Spanish sportsmen that they have a lot of success for the last couple of years. If we talk about golf, well, Sergio Garcia is doing well another time. He is playing fantastic after not an easy past years for him. For sure, always in golf Tiger Woods, his eyes, mentality when he’s playing, when he’s competing is, you know, he’s very, very difficult to say I cannot admire this mentality on a golf course and on the competition, no? He really, you know, is focused on what he is doing, and he really believes that he gonna make the right shot in important moment. That’s something. His determination in important moments is something difficult to have, and he has. I admire that a lot. Q. You had battled it out in the second set. How important was it to make sure it didn’t go to a third? RAFAEL NADAL: Well, if I was on the third, I was on court. I gonna still be on court already fighting, no? But I play my best game of the match in the 5 3, playing very aggressive, having two very, very good points with my forehand down the line. So that was very important, no? And for sure especially have the break and the game with double fault, be able to forget that and be able to be focused on the next game, on the first point of the next game, and finally do the right things to be back on the set was decisive, because for the other was a hard moment, in my opinion.